This temple is kind of hidden gem and less frequented than other temples but it can provide you with some of the best temple shots in town. The small detailed features outside and an intricately designed interior make this place so special. 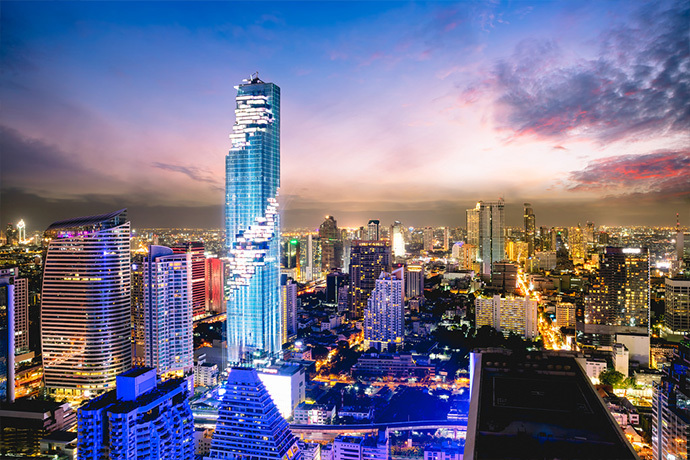 Apart from the temple itself you will have an almost unobstructed view to Bangkok newest attraction, the MahaNakhon tower building. The building is a mixed-use skyscraper in the Silom-Sathon central business district of Bangkok and was opened in December 2016. It is now the second highest building in Bangkok at 314.2 meters (1,031 ft) with 77 floors. As if the extraordinary architecture with revolving cubes was not enough, they built a glass balcony and observation deck called SkyWalk that was recently opened in November 2018. 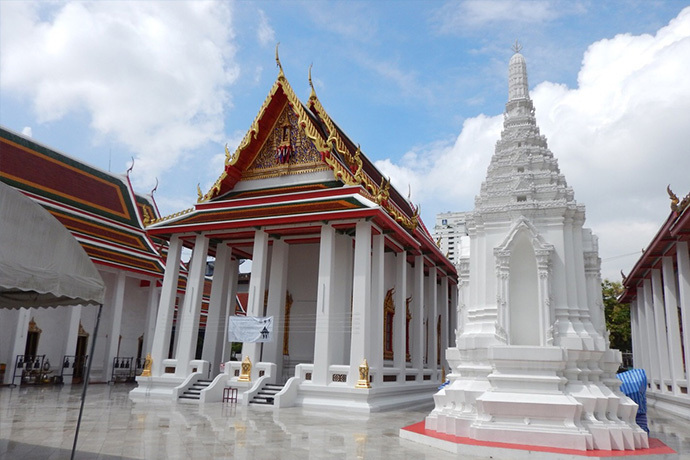 If you think that Bangkok has only temples to offer, these two historic churches will prove the opposite. They are both near the Chao Praya River and not to far apart. 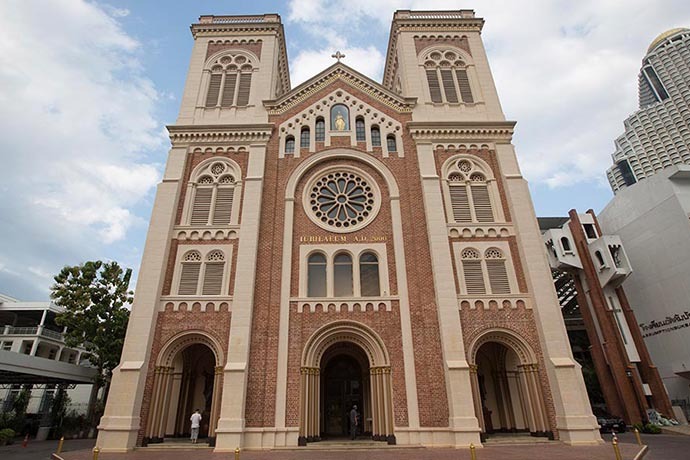 The Assumption cathedral was rebuilt in the romanesque style between 1910 and 1918 with a red brick exterior which stands out against its surrounding white buildings, inside is a high ceiling adorned with many ornate decorations. The Holy Rosary Church is a Gothic Revival church built between 1891–1897 with a tall steeple & elaborate stained-glass windows. 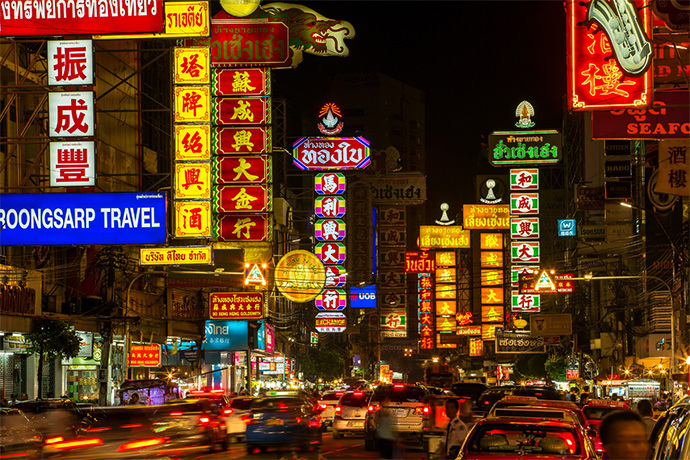 Bangkok’s Chinatown is one of the largest in the world and not only interesting for photographers. You can find numerous shops selling traditional goods as well as souvenirs, and it is especially known as a gastronomic destination. It comes alive after dawn which is also the best time to take a picture of the neon-lit street but also to indulge in the offered street food. Is a Hindu shrine featuring a gilded statue of the god Brahma and often the site of rituals and dances. 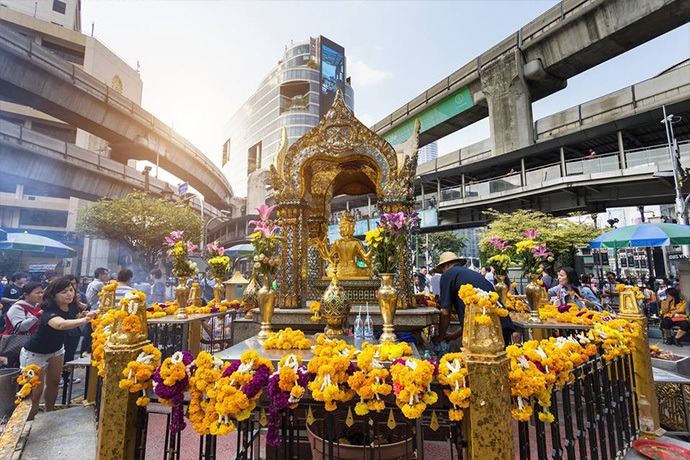 The Erawan shrine was built in the 1950s after some unfortunate events during the construction of the Grand Hyatt Erawan hotel. For the best pictures come at night to the elevated walkway nearby. The walkway connects the BTS stations Siam and Chit Lom and is just a short ride from the hotels in Sukhumvit area. To get the most of these activities, you might need to book a place on time as there might be a rush for rooms in several classy hotels near Sukhumvit.